Hello and welcome everyone to another edition of Graps and Claps, this time taking me once again to dirty Leeds for Tidal Wrestling’s second to last show this year at The Temple of Boom, with the return of reigning champion Sugar Dunkerton being the hot topic of conversation in among what pants a certain Mr.Brady Phillips would be wearing on this evening after his Rupert the Bear efforts of last month. Arriving in Leeds for 2pm, after spending the morning drinking countless cups of coffee and watching NXT Takeover it was time to get back on the horse and first visit one of the lesser visited places in Leeds that I go – The Brewery Tap which is home to beers from the Leeds/Leodis Brewery range, first off was a pint of 5% Dunkel Hefeweizen Stottie from Camerons Brewery (£4.60) which is a drink made from reused bread, on reflection this was an OK drink that lacked a strong wheat flavour which you tend to get from wheat beer’s like Erdinger and other brands of that type. Second pint in here whilst we were all thinking up songs related to Baby/Lady, was a pint of Leeds Brewery Midnight Bell (£4.05) Stout that would accompany a good steak if you are having food or in fact just as a session beer for a winter’s afternoon. A change of pace next, as instead of going to a pub we made a visit to the Leeds Christmas Markets on Millennium Square for the usual overpriced Bratwurst and gassy ale which usually frequents the Manchester Markets which is like hell on earth. 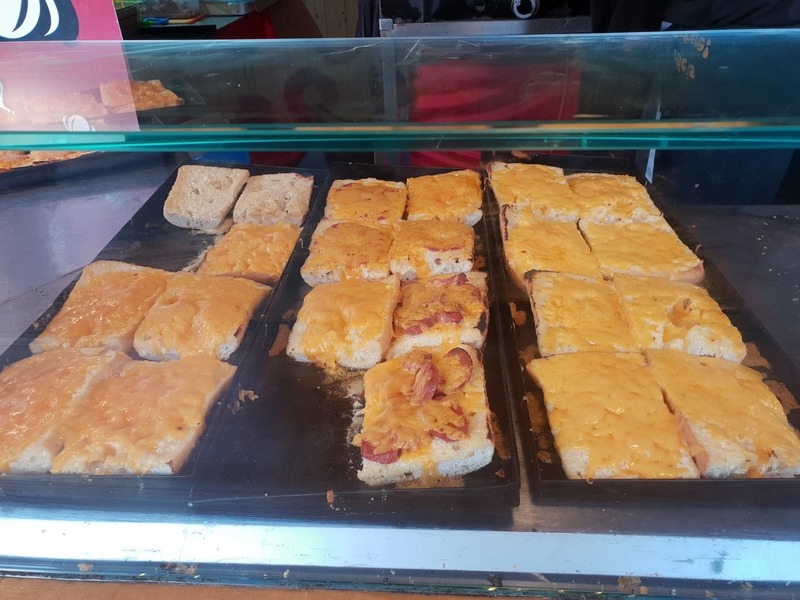 Thankfully the Leeds Market are much quieter with more room to move which made it instantly better for that fact, here I had 2 bottles of Hofbrau Dark Wheat Beer (£4.50) and something called Knobi Brot (Not Knob Rot) which was a thick piece of bread topped with Garlic Sausage and Garlic Sauce with Cheese involved as well costing £5 – tasty as anything but obviously the garlic smell would mean I wouldn’t be kissing any ladies of the night tonight (standard with my track record of 1 relationship). Fully filled up, we moved on to a newish pub on the way called the Social which is one of those student type bars in the way it looked and home to a very cramped toilet with not much room to swing a cat. Only the one drink in here with a £4.60 pint of Kirkstall Brewery Providence that was a fruity tasting ale but not as smooth as the Double IPA that our Geoff was drinking which tasted like a dream. 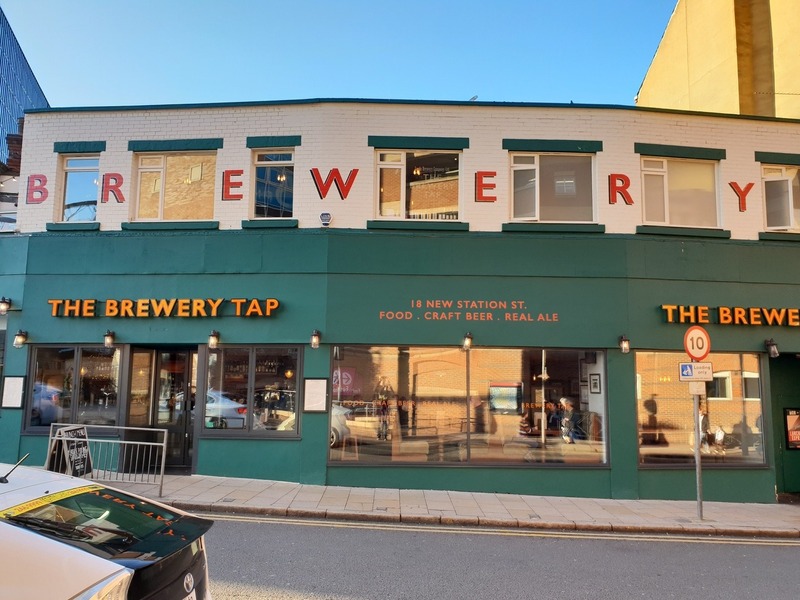 Final pub was a swift visit to Brewdog for 2/3rds of Wiper and True Plum Pudding, now with Wiper and True I fully recommend you try any of there drinks in bottles which are widely available in your local beer shops. So with that said, let’s get into what went down at Tidal Wrestling ‘Sugar Rush’! With a packed crowd of about 120 in attendance, we were first introduced to El Ligero who wasn’t wrestling on the evening due to the WWE UK deal where they can’t wrestle a week before one of there shows, instead though Ligero came out to thank the crowd for their support over the 5 years that Tidal has been going and trumpeting the thoughts that I have penned in this blog over the last year or so of why Tidal has proven to be one of the highlights of the undergraps scene. 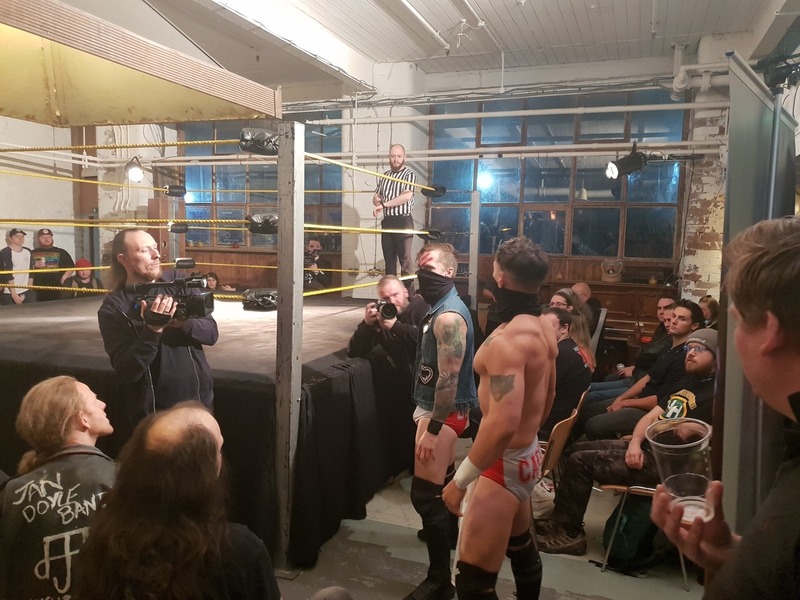 First match of the evening was H.T Drake fresh off a win against Crater at the last show taking on Rocky Mac who even though he is Irish, plies his trade exclusively in the London area for Frontline Wrestling and the London School of Lucha Libre. One thing that our section of the crowd was trying to work out was – who was the famous Collins on Mac’s tights, in our own judgement we decided it was Phil Collins and began to sing Phil Collins/Genesis tunes at Mac. In a good opener, Drake had hit a Coast to Coast dropkick on Mac before following up with a springboard kick for a 2 count, Mac however did make a comeback and was looking near the end at using his hurling stick to floor Drake, but as he did he walked right into a lung blower by Drake who picked up the 3 count. Drake with this victory now goes on to a 3-way title match on the 16th December vs Sugar Dunkerton and Soner Dursun. 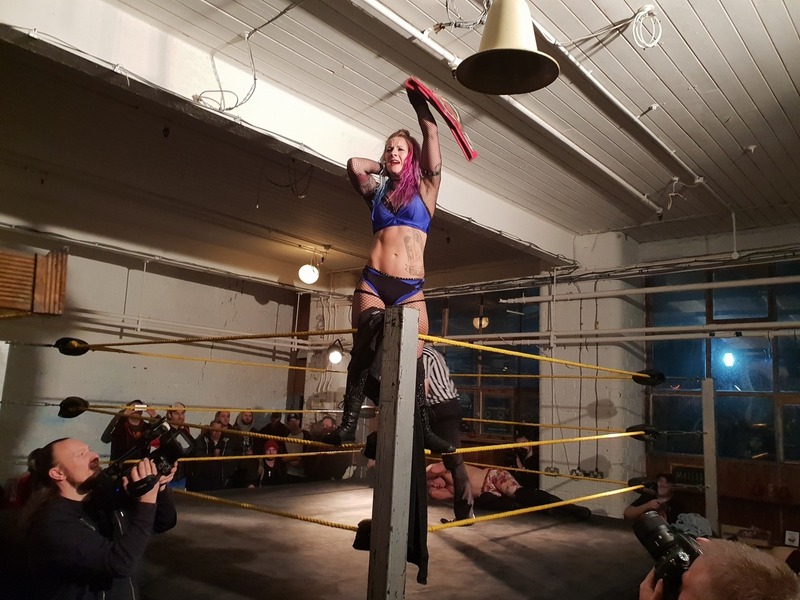 Next up we had a women’s contest between Ruby Radley and Natalie Sykes, the latter who impressed in a 5-way match 2 months ago against some of her male counterparts. In a back and forth contest, Natalie Sykes looked on her way to victory her but out came Ruby’s tag team partner Ivy to sneak up from behind to wallop Sykes round the head with a stick to cause the DQ and then to add insult to the head injury – a sustained beatdown much to the disgust of crowd. These 3 competitors are now involved in a 5-way Women’s title contest at the December show, which could play into Ivy and Ruby’s favour using the numbers advantage but we will have to see. Nsereko did eventually manage to get the hot tag to Sebb who is one of the best hot tag wrestlers around in the North, cleaned house leading to the Lion Kings eventually finishing off there plucky opponents when they hit the Neckbreaker/Powerbomb combination to Charlie Carter to retain the titles in a really good match. The Lion Kings now go on to face another set of fresh challengers in December as they face what looks an interesting team on paper in the form of B.A Rose and Will Kroos. OOH HERE SHE COMES! WATCH OUT BOYS SHE’LL DRINK YOUR CANS! OOH HERE SHE COMES! IT’S A MARTINA! Anyway back to the match, with Martina seemingly on top and on her way to victory she hit what looked like a match-winning headbutt but she hit it with so much force that she fell flat on her face, with a dazed Rhio picking up the scraps to pin Martina to become the new TCW Women’s Champion to cap off what has been a great 6 months or so for the Preston native. On reflection from a wrestling standpoint this was maybe my favourite match of the evening, with Martina now looking a world away from the Veda Scott debacle at WXW and looking excellent in the process, also give Rhio her due she has gotten over well as a fresh faced baddie in this promotion which has added another layer to her character which can only be good for the future – top work ladies! Back from half time and sadly once again no Vegan Curry, but the Vegan Chicken Burger has won a few fans locally so give that a try if you are visiting next time at the Temple. We returned in the second half with a rematch from last month’s show with Sean Only trying to avenge his loss of last time taking on Will Kroos who was looking to stake his claim for a possible title shot in the future. Kroos was on top early hitting a slam for a two count, whilst also countering a sleeper from Only into a suplex and a cannonball for a 2 count. Only was then put in an arm submission but managed to get to the ropes, Only recovered from this setback though to hit a curb stomp and a ddt to the man mountain Kroos for a 2 count, this though must have really got to Kroos who soon had enough and walked out on the match seemingly wanting to save himself for another time, your winner then by countout – Sean Only! Match six of the evening was for the TCW Openweight Championship with the challenger Little Miss Roxxy taking on don’t say it too loud but our ‘Secret Favourite Wrestler’ of the Undergraps scene and crazy pants wearing champion of Kettering – Brady Phillips. As ever Phillips was wearing an interesting set of flowery pants topping the Rupert the Bear pants from last month, lots of singing in this one with the aforementioned songs involving the words of Baby/Lady. 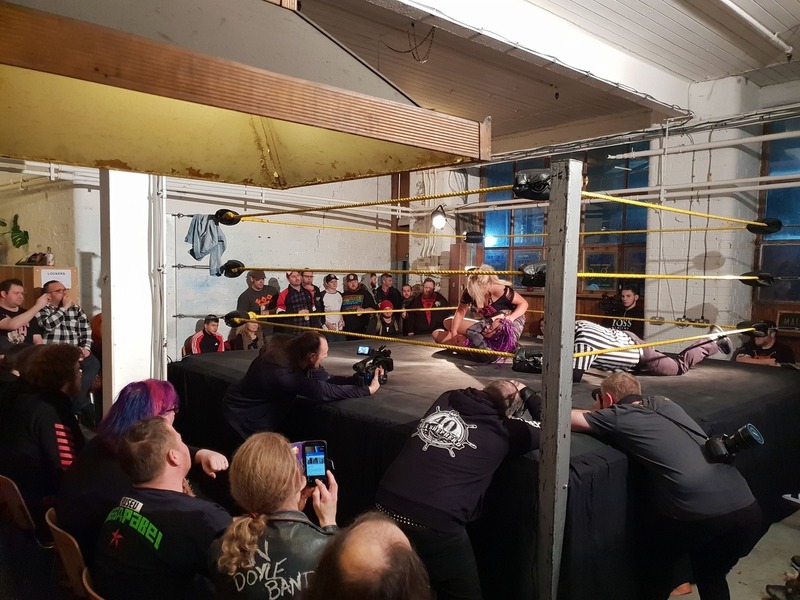 Even though we didn’t have many songs for Roxxy, the crowd were in full favour of the geordie starlet to dethrone Phillips, despite last time when Roxxy lost to Chuck Mambo but I guess she has proven herself more than capable against the chaps. The big talking point about this match will no doubt be the finish of this match, where it was first thought that Phillips who tried some underhanded tactics behind the referee’s back to pin Roxxy to supposedly retain the title, but that was until chief commentator Colin got on the mic to say he had enough of Phillips trying to sneak away with his title and ordered a restart of the match which involved a replacement referee due to the initial official getting flattened by an angry Brady. Brady’s frustration at this decision soon proved to be his downfall as Roxxy pinned Brady to capture the TCW Openweight Title in a chaotic finish to end what seems like a 1 year title reign and a very successful one at that as well, but with this defeat I can only see Brady turning his attention to the TCW Heavyweight Title in 2019 but we shall just have to wait and see. Semi Main Event now with the Leeds darkness setting in outside, we had another American on a U.K excursion with Darius Lockhart taking on everyone’s favourite – Rampage Brown coming out to the bellows of the crowd singing ‘I Will Be Heard’ which is still a banger to this day. Lockhart in this his Tidal debut impressed early on as he got Rampage in the mount to get in some strikes and punches landing on the big Yorkshireman, but it would be Rampage who soon got back on top in a hard fought contest near the end when he used his considerable size and strength to hit Lockhart with a three move combo or a Brainbuster followed by a Powerbomb and then finally finishing the plucky Lockhart off with the Piledriver of Death to get the victory. Rampage next month now goes on to face The Great O-Kharn in what should be a hard hitting contest, then not so long after he get’s a TCW TItle opportunity in February against Sugar Dunkerton in Newcastle which is certainly a 50/50 pick ’em contest for the fans. Main Event time now with Spike Trivet taking on the TCW World Champion Sugar Dunkerton who as ever had the audience eating out of the palm of his hand to the Archies hit ‘Sugar Sugar’ which has also spawned a t-shirt celebrating what has been a whirlwind year for Sugar who is on his 3rd tour of the U.K this year despite being a relative unknown to a lot of people, so he deserves a lot of respect for taking a chance on himself which has so far worked out a treat. The first 5 minutes of this match was the usual crowd antics singing for Sugar, whilst Spike sat on in bemusement from the front row, once back in the ring with Trivet getting the Tory hating chants from the crowd, both men had a feeling out process in the form of a dance off and a push up contest which Sugar got the better of. Even though Trivet had his moments in this contest, it was The Leader of the Band Sugar who eventually put away Trivet with the match-winning Brainbuster to send the Leeds faithful singing and dancing long into the night celebrating their charge’s victory to end another successful night’s worth of action in The Temple of Boom. As seen on this evening, the word of mouth of people to check out Tidal is spreading with them packing out the Temple of Boom on this evening and with one show to go this year, it has certainly solidified itself as one of the best kept secrets on the Undergraps scene that I wholeheartedly recommend that you go and see just the once or maybe more. 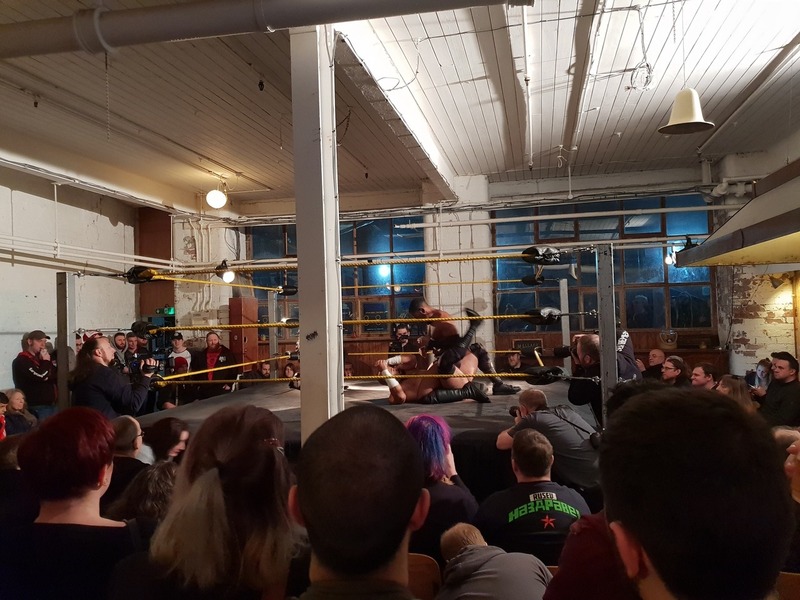 I hope you have enjoyed reading this review as ever and while I am at it go and give Andrew Gibney’s review of the Futureshock Wrestling show on the same evening a read (he did a sparkling job in my absence). Give that and also reviews the usual likes and retweets and I will see you next time for reviews from Liverpool of NXT UK plus also NGW in Keighley, so until then – BYE!